Picture by Bridget Wilde. Click for larger scan. 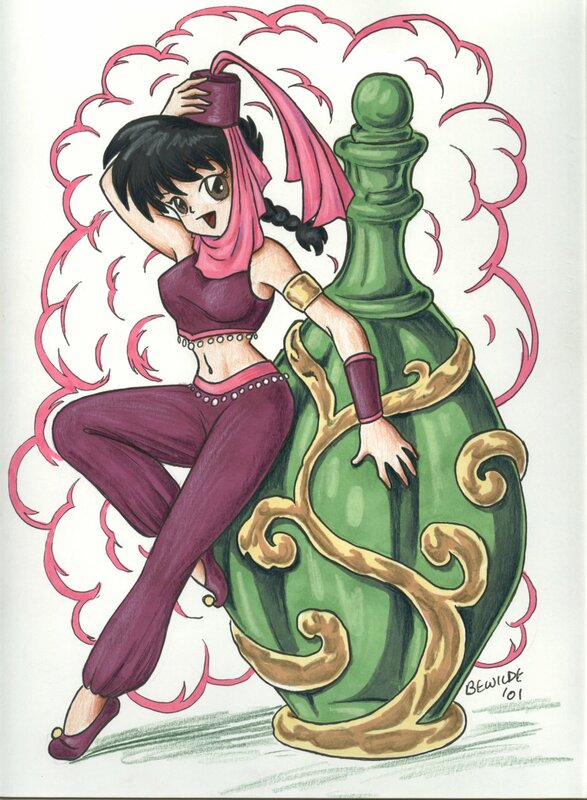 What if... Ranma had fallen into the Spring of Drowned Genie? While in female form, any wish he hears is fulfilled -- but all wishes are undone when he goes back into male form. Happosai has his underwear stolen. With guest appearances from Oh, My Goddess and a cameo (sort of) from Maison Ikkoku. A shady character offers to help Ukyo eliminate her business competition — but she has other ideas. 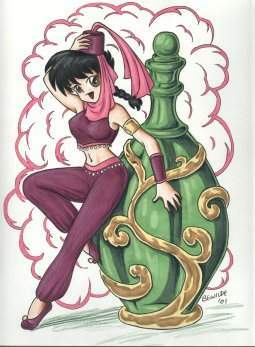 Ranma is stuck in female form, possibly for life. Is this the end of his relationship with Akane? And how will the other Nerimans react? A far future story. After Ranma and Akane have passed away, Ukyo finds herself at Jusenkyo. Things in Nerima are exactly what they seem... right? Ranma is stuck in his "cat fist," and nothing Akane does seems to help him. Who or what is responsible, and is there anything she can do to save him? A parody of Otaku Self-insertion fics. An anime fan is sent by a Goddess into the Ranma 1/2 universe, but things there don't quite go as planned. A sequel to the story Cursed by Richard Lawson. Ranma has been completely taken over by the consciousness of the girl who drowned at Jusenkyo all those years ago. Can he be saved? If so, what will be the cost? And weren't there other people with Jusenkyo curses? One of the series regulars (not Ryoga) becomes seperated from the others in a place far from home. A grim-and-gritty urban story but with a more or less happy ending. Mature subject matter warning applies. My invited contribution based on The (Sur)real World by RpM. An alternate universe story. Who's that who's married to Ranma in the future? Oh my! It's Kasumi! How did that happen? After Akane fails to spot obvious evidence that P-Chan is really Ryoga, Ranma starts to wonder if she hasn't been playing dumb all along. A crossover between three of Rumiko Takahashi's manga series: Ranma 1/2, Maison Ikkoku, and the Mermaid Saga. Ranma moves in to Ikkoku under a false identity as bait to catch a serial killer. Part 4: Who Are You?